Walking around Cuenca, there are a surprising number of Japanese tourists. Bit odd, you might think. How on earth did they fetch up there? 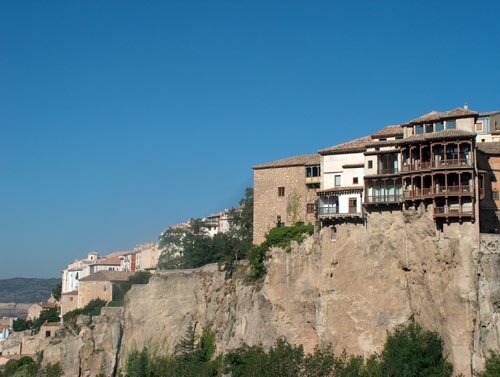 Attracted by the abstract art, by the lure of Cuenca being a World Heritage Site? Not exactly. Strange as it may seem, the town is the backdrop for a very popular Japanese cartoon called Sora no Oto (Sound of Heaven), which has been shown in Japan since January 2010. In the cartoon, the teenage characters have to defend a fortress in a hilltop town, called Seize in the series, but which is in fact Cuenca and features all the main monuments. Today you can get to Cuenca from Madrid in less than an hour on the high-speed train, but you soon leave the city behind and start travelling through surprisingly wild countryside. 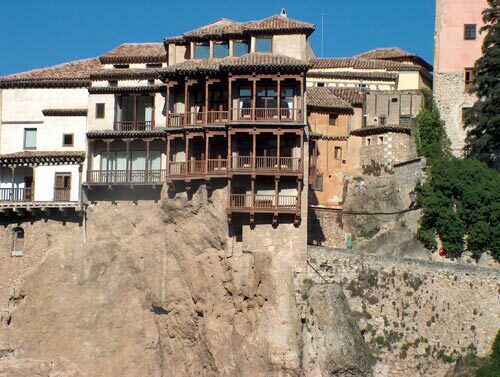 Cuenca is the main town of of one of the biggest provinces in Spain, but the area also has one of the lowest populations, with only 12 inhabitants per square kilometre. The landscape features strange limestone formations in soft tones of ochre and grey, eroded over the centuries by wind and water. The old town sits on a narrow, curving spur, 1,000 metres high, between the ravines formed by the Jucar and Huecar rivers, and surrounded by pine forests. At the beginning of the 1960s, the artist Fernando Zobel was looking for somewhere to put his collection of Spanish abstract paintings and sculpture on display. This was not as straightforward as it seems. Under General Franco’s dictatorship, it would have been impossible to exhibit the work in Madrid. At that time, avantgarde culture in any form was regarded as subversive and anti-Spanish. Zobel’s friend, the artist Gustavo Torner, suggested his home town of Cuenca, 160 km east of Madrid on the road to nowhere. Back then, the old town, set high on a hilltop, was all but abandoned and most of the buildings were in ruins. What little life there was took place in the new town at the bottom of the hill. Being so cut off, it was an ideal choice for the museum, as those in the know could come and visit without attracting the attention of the authorities. With the help of a few other artists, the Museum of Spanish Abstract Art opened in 1966. Very few museums are conceived by the artists who actually created the works on show in them, and maybe that is one reason why this one delivers such a strong punch. Another is its extrordinary location in a group of buildings dating back to the 14th century, known as the Hanging Houses, right on the edge of one of the ravines. The name comes from the fact that although at street level the houses appear to be only three or four storeys high, there are several more floors built into the limestone rock down the side of the gorge. While the museum is the most well-known example, the style is used all around the perimeter of the town, with houses seeming to ooze over the top of the spur. Abstract art turned out to be the unlikely saviour of Cuenca. The museum became a magnet for artists working in Spain in the 1960s, many of whom ended up buying houses in the town. Antonio Saura, one of Spain’s most important 20th-century artists, was already a sometime resident as his family had a home there. Saura died in Cuenca in 1998 and, in accordance with his wishes, a foundation was set up to show his art in a grand mansion, the Casa Zavala. Saura is, of course, well represented at the Museum of Spanish Abstract Art, and his paintings are some of the highlights. The building may be medieval, but the interior has been transformed into a series of white spaces with mustard marble floors. The views across the gorge complement the art on the walls rather than detract from it. The collection is a comprehensive representation of Spanish art from the 1950s and 60s, with work by Antoni Tapies, Eduardo Chillida, Gerardo Rueda, Cesar Manrique, Jose Guerrero and Lucio Munoz among others. Since 1980, it has been run by the prestigious Juan March Foundation. From the museum, I wandered along winding, cobbled lanes lined with old mansions. The main square is dominated by the cathedral, a mix of Gothic and Anglo-Norman architecture not seen anywhere else in Spain. Later on, from one of the many tapas bars, I gazed at the gorge, illuminated for full dramatic effect, with a glass of local wine, some tangy Manchego and a dish of morteruelo, the chunky game pate that is a speciality of the province. I could understand why so many artists came to Cuenca and somehow never left, but doubt whether any of the new Japanese fans of the town will end up living there.